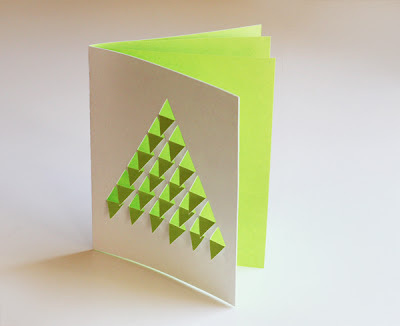 I tried out a simple, geometric Christmas tree card made from solid-color papers. To make your own, get my template file right here. 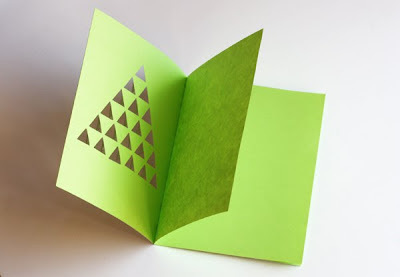 Then glue a colored sheet of light-weight paper to the back of the cardstock. I used my fancy Xyron machine and some cheap Astrobright paper from Office Max. You could also use spray adhesive to glue the colored paper to the white cardstock. Or better yet, find cardstock that's already two colors. 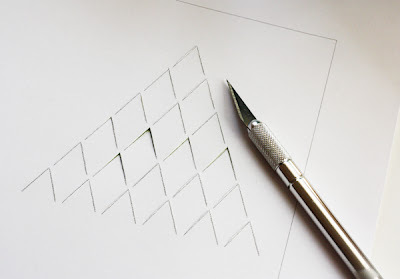 Next, cut along the printed lines with a sharp craft knife, slicing all the way through both sheets of paper. Try to keep to the outside of the triangles so any printed lines will be hidden when the flaps are folded down. Then cut out the card. 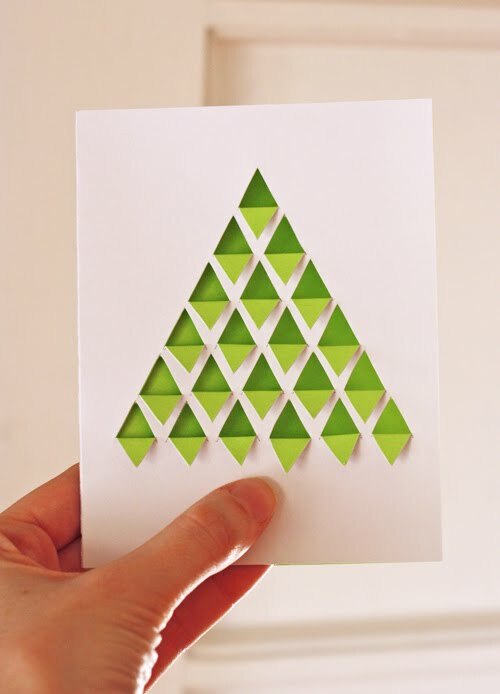 Fold the pointed flaps down to form the tree and fold the card in half. If you write inside the card, your message will show through the holes in the front. So if you like, add a second sheet of colored paper to write your message inside. Cut matching paper to 8.5" x 5.5", fold it in half, and use a strip of double stick tape to secure it to the inside back panel of the card. 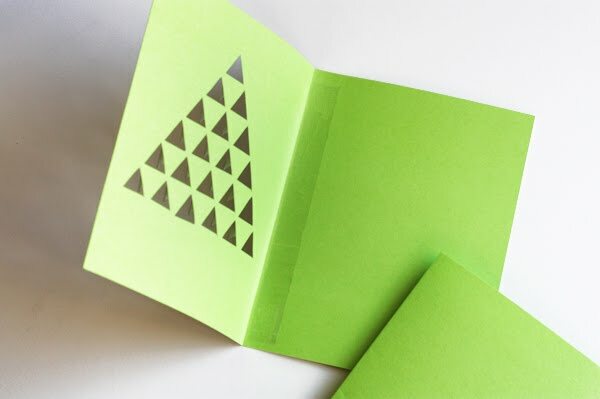 If the triangles won't stay flat enough for your liking, lay a heavy book on the card for a little while to press the flaps open. I like how the cutouts create shadows and a 3D look. Genius! Such great inspiration. I used to make bookmarks similar to this for my mother when I was young. Part of a project I'm trying to get on my blog for weeks: Old pictures in new frames. The frames are finished but the pictures are still just pinned on the wall. maybe you gave me the kick now to finish it. It's so great how differnt cutted and folded paper looks like. Courtney would like helping with that... she'd have fun punching out the triangles! If I were really ambitious. IF. great idea! i think this would also work well with heavier scrapbooking paper with a different design on each side. Awesome!! It looks so ornate but is really simple to make :) I'll definitely have to try it!! Great card but would also make a great holiday wallhanging. Thanks for the inspiration. So nice, thank you for the idea! I love that!!!! Thank you very much for sharing this amazing idea! Really like this look of this. I've been struggling to think of a design I'd like to do for my cards this year - this is very inspring! Did you try adding a trunk? I liked it kind of minimal so I didn't, but it would be easy. Just cut three sides of a square in an upside-down U shape, for anybody who wants to try it. How fun is that!! I am thinking about other patterns one might could do!! Semi circles on trees or ornaments, squiggles and drop the tops down... Oh ya too cool! thanks fot the great idea You go girl!! Nice and simple, thank you! Thank you! I made one today and it looks great sitting on my mantle. After 45 years or so I still remember my college-age sister making me a construction paper alligator using this technique for his spiny back.It is perfect for a fir tree too. Love this idea - thank you! Super!! !I will make it for sure! I made a few of these and they turned out so great! I found paper that was light green on one side, and darker olive green on the other. After the triangles were folded down, I put a little glue on each of the tips and put clear chunky glitter on it, like snow on the tree branch ends. What a nice simple idea!! Love it! What would you suggest for those of us without the wonderful Xyron machine (serious envy!) and would rather not use spray adhesive? At my old job we had to get the Material Safety Data Sheets for everything we used (an OSHA thing) - spray adhesive, rubber cement and bestine were extremely scary. Based on the information sheets we got rid of those products but I don't remember what we used instead except getting hospital masks to wear when using spray adhesive outside. Hmm... you could try a glue stick, but make sure to cover the entire surface of the paper with glue so the two sheets are laminated together. Sounds tricky. I'd probably just try to buy 2-sided paper. Maybe try these: packs of 25 sheets for $6.99. I love this card! I make my cards every year and just found this today (Jan 11). Maybe I have time to make them for next Christmas. LOL Do you have a shortcut for making a lot of these cards? I send out 60+ cards every year. Leuke Kaart heb de kaart ondertussen al een paar keer gemakt. As for how to make these cards more quickly, reduce the number of triangles. Enlarge the new triangles so they will fill in the original space. You'll crank out cards more quickly. The new one Won't be as good as the original, but will still be impressive.